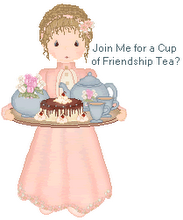 This one comes with a mini tea set, punchout place cards and more punch out fun! There are many different books on planning children's tea parties. Most, in my opinion, are written more for adults, while a few are written for children to read and use. All of them include some ideas for menu planning, recipes, different tea party theme ideas, games, activities and crafts. Most of the books also include ideas and information about invitations and tips on who to invite, etiquette and hosting. Often they include facts about tea and how to make a proper pot of tea along with beverage suggestions ideas to substitute for tea. I helped the #2 (younger) daughter plan a tea party for KJ's 7th birthday last spring. My advice was to keep the menu simple with foods the children would eat and have lots of fun activities planned. The girls enjoyed lemonade poured from a pretty teapot. PNBJ finger sandwiches, carrots with ranch dip and cheese and crackers were served from a three-tier server. KJ had a pretty birthday cake decorated with a mini tea set for dessert. They played dress-up and games, (pin the handle on the teapot and more tea themed games) made crafts and had a fabulous time! I must have that fairy tea party book! Moms still doesn't have electricity! They are ok but she had this post set to publish prior to losing her power. If I may add a new book to your list- "Nature's Royal Tea Party". It has limitless inspiration for children and grown up tea parties. I feel in love with your web site. I took tea party lessons as a child with the book "White Gloves and Party Manners." At age 9 my neighbor was fron England and she and I had tea time almost daily. Now I am writing my first fiction about a little girl who is fascinated by her mother's teacups. That's how I found your site...doing online research. I am eager to see what my artist will do for a cover. Thanks for creating a lovely site to visit.